The European Space Agency's Mars Express radar probe has returned evidence that the planet once hosted an enormous ocean in its northern plain from sediments reminiscent of an ocean floor, within areas that have been suspected to be shorelines. Jérémie Mouginot from the Institut de Planétologie et d'Astrophysique de Grenoble (IPAG), the University of California in Irvine, and colleagues analysed more than two years of data from Mars Express' Marsis (Mars Advanced Radar for Subsurface and Ionosphere Sounding) radar that penetrated 60 to 80 meters under the surface evealing that the northern plains are covered in low-density material. "We interpret these as sedimentary deposits, maybe ice-rich," says Mouginot. "It is a strong new indication that there was once an ocean here." This later ocean would only have lasted about a million years or less, Mouginot estimates, and then the water would have either frozen back in place or turned into vapour and lifted gradually into the planet's weak atmosphere. "I don't think it could have stayed as an ocean long enough for life to form," Mouginot said. "Previous Mars Express results about water on Mars came from the study of images and mineralogical data, as well as atmospheric measurements," said Olivier Witasse, a Mars Express project scientist at the European Space Agency. 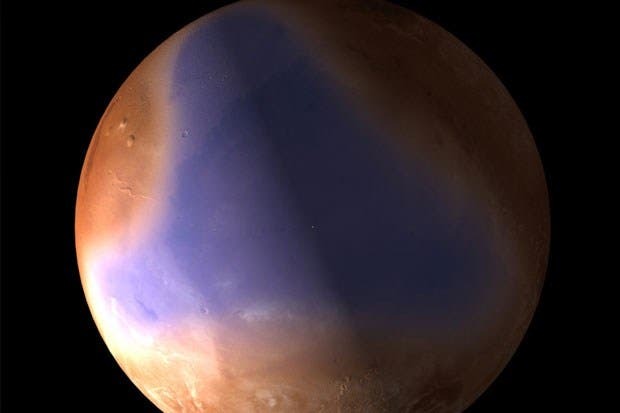 This data supports a proposed theory where Mars has had two oceans in its lifetime. One four billion years ago when warmer conditions prevailed, and another three billion years go when subsurface ice melted following a large impact.